As September approaches, it's time to start thinking about gifts if we have a September birthday, or if one of our nearest and dearest does. One unbeatable gift idea is to give sapphire jewellery, as it happens to be the stone associated with the month of September. Of course, as jewellery lovers here at The Earring Collection, that would be our recommendation! We have fine examples of the stone set in solid sterling silver in the form of earrings, bracelets and rings. These Burmese Sapphire and hallmarked sterling silver bracelets would make wonderful gifts. Traditionally, sapphires are associated with the colour blue, (although they can be black, purple, green, grey, yellow and white, known as 'Fancy Sapphires'). Throughout history, this has meant that they have been associated with spirituality and the heavenly realms. Sapphires have also been prized for their relative hardness, second only to diamonds, making them a very popular choice for every day wear, particularly engagement rings.The sapphire ring given by Prince William to his bride to be, the future Duchess of Cambridge, formerly belonging to his Mother, Princess Diana, is a very well known example. 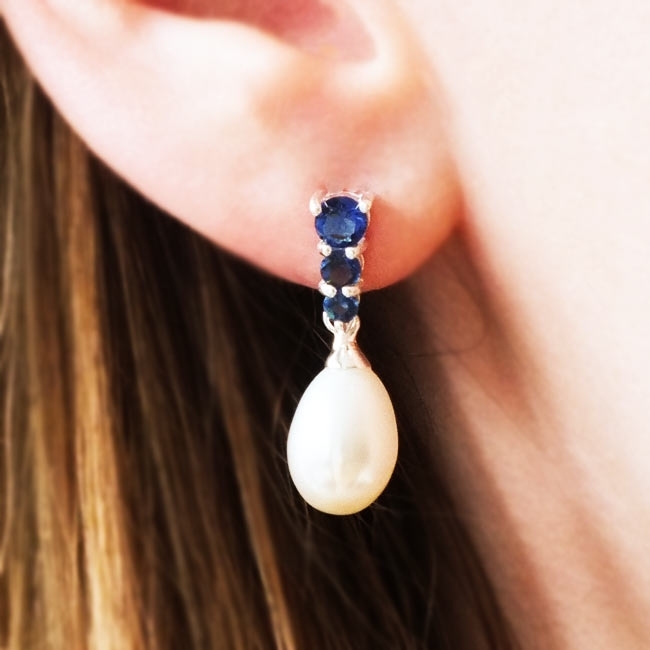 The contrast between the snowy whiteness of the pearl and the intense blue of the sapphires in these drop earrings makes them a classic statement piece.